Normally it takes me ages to finish a book as I find that reading is so soporific that I usually fall asleep after 5 or so pages which can be annoying. But joy of joys ‘The Well-Watered Land’ has broken that curse, I would finish a page and then eagerly turn it over time after time to the next one. Every year there are many good books published about Dartmoor but without doubt, in my opinion, this is the best one for many a long time and I do not say this lightly! Between the pages are tales, anecdotes, memories, local characters and little known facts that vividly describe hill farm life in and around the Laughter hole, Babeny and Poundsgate areas. 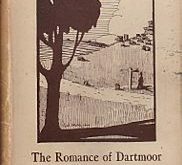 The time-span of the book starts in the 1940s and runs through to the modern day and charts many of the changes that have occurred both in the author’s lifetime and that of Dartmoor. I really love the occasional scatter of local ‘wise saws’ and adages that grace some of the pages, just as relevant today as they were then. For instance; “To steal a goose from the common is a crime. But the greater crime is to steal the common from the goose.” I will not spoil the book by quoting anymore however there are plenty more where that came from. You will also read some of the old tales such as that of ‘The Snaily House‘, ‘Jolly Lane Cott’, and ‘Dinah Tuckett, the Dunnabridge pound-keeper‘, ‘Meltor Fire Wheels‘ to name but a few. Do you know what a ‘fuzzpig‘ or ‘shavers‘ are? More to the point would you ever eat a ‘shaver’ and why was it so called? You will if you read the book along with a host of local dialect terms and names, all explained in the glossary. The Well-Watered Land’ contains many old photographs of the people, places and past events which compliment the various chapters, which really brings the book alive. If you really have a love of or interest in Dartmoor then this book is a must, especially if like me you enjoy stepping back to the halcyon days when times were hard but so different to today. With Christmas just around the corner I could not recommend a better gift that will truly be appreciated and provide so much enjoyment than this book. It’s available from most local bookshops, many of the Dartmoor National Park’s visitor centres or at the usual online retailers. I very much enjoyed this book. It really seems that farmers world-wide are much the same, with similar problems and joys. Wei done Jez. One thing though I would like to bring toJez Wilkinson’s attention is that Guthrey Bowron who educated himin the arts of shearing isNOT an Aussie. He is a Kiwi, New Zealand’s own.